Martin Fayulu is widely believed to have been the true victor of the DRC's 2018 elections, but is not president. We spoke to him about his next steps. Martin Fayulu shouldn't be here. He shouldn't be sat across from me in this hastily-vacated office we commandeered after his modest event at the Royal African Society in London. He shouldn't be here, leaning back and forth in his chair and banging on the table, as I try to hold him accountable with my scribbled notes. The 62-year-old businessman and politician won the presidential election in the Democratic Republic of Congo (DRC) less than four months ago. Selected by the high-powered opposition alliance Lamuka to be their candidate, he drew breathtaking crowds eager for change after 18 years of Joseph Kabila. Fayulu should be busy in Kinshasa, working out how to govern a complex nation of 80 million people, and instigating the urgent reforms that millions of voters demanded. And yet here he is because, crucially, he is not president. Martin Fayulu's business cards may call him "President Elect" - an act of self-branding that comes across as more endearing than audacious, a little reminiscent of "World's Best Dad" mugs - but he is not. 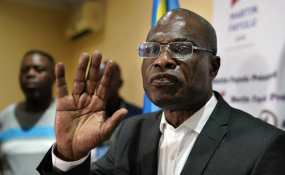 Leaked numbers from the electoral commission and data from the Catholic Church's thousands of observers suggest Fayulu garnered around 60% of the vote in the December 2018 elections. But when the official results were announced in January, opposition figure Felix Tshisekedi was declared the victor. Rumour has it that Tshisekedi and Kabila had struck a quick deal after the outgoing president's intended successor, Emmanuel Ramazani Shadary, proved deeply unpopular in the polls. As Tshisekedi became president, the world held its breath. Would voters accept this unholy compromise? They desperately wanted Kabila to step down and to pick their next president. They arguably got the former but not the latter. In the end, there were not huge domestic protests and most international parties minced their words, seeing the election as illegitimate but its outcome as good enough for them. Fayulu, however, fights on along with Lamuka, or at least some of it. What is your strategy now going forwards ? The will of the people should be respected. My strategy is based on that. Everybody wanted change in the Congo and said "don't betray us". I don't consider myself as the opposition. I won the election. I am the president-elect. I have to facilitate the Congolese people to recover their victory. I am trying to help them because I don't want violence. In the eastern part of the country, the situation is very tense. My strategy is to talk and sit down together. We propose a solution of redoing the elections in 12-18 months. Who will finance it? The international community said they will not, but they should put their hands in their pockets. What is the cost of continuing like this? People going on the streets, people resisting, even if it is passive resistance, business people not coming to the Congo. What will be the cost of redoing the elections? $200-300 million? Why would anyone agree to fresh elections? Tshisekedi and Kabila are comfortable in power and the international community is happy to move on. The international community gave lip service to Tshisekedi's victory. The UK didn't expressly welcome him. If the government continues like they are, I will tell the people - with the popularity and legitimacy I got from the elections - "don't follow the government". The crisis will amount and then one day Congo will explode. In Algeria, President Bouteflika didn't think he'd be sent out of power. In Sudan, the same. The government has to decide if they want the people to come to the streets to tell them to go or if they will have a peaceful transition. At what point do you give up on talks, which seem unlikely, and go straight to calling for protests? It will not take long because the people have already started to tell me "you have to let us go on the streets". I think that before Easter we should have something. If not, there will be a disaster. If you don't hear anything by Easter, you'll encourage people to take to the streets? It's not that I will encourage them, but I will not stop them. Today I'm stopping them. Tomorrow I will not stop anyone demonstrating. You say people are ready to protest, but from a distance, it looks like most people just want to get on with their lives. They could have protested immediately after the elections. They didn't protest because they know the brutality of Kabila. People are calling for me everywhere in the Congo. This is a sign they are fed up. Sometimes protests go down, but I've decided not to let this go down. I'm touring the country. I think we have to fan the flames. Are there any circumstances in which you would join the government to make change from within? I cannot join the government. Not at all. The only thing is that, if we create a body for institutional reform and organise elections, Lamuka can manage it. And, if they say that because of my legitimacy I can calm the people, I could lead that organisation. Kabila sent someone to ask me if we can meet. I said we cannot meet in the dark. We must meet openly. Kabila and Tshisekedi with a few others can meet with myself, Moise Katumbi, Jean-Pierre Bemba, Adolphe Muzito, Freddy Matungulu Mbuyamu, Jean Philibert Mabaya, Antipas Mbusa Nyamwisi. Six or seven on each side. Some would say you have more chance of making change from inside the government than outside. There is no chance, because Kabila will not let anyone succeed where he lost. He has 342 of 500 seats in the National Assembly, 92 of 108 in the Senate. He controls the local parliaments and most provinces. The regime spent a lot of money winning the Senate elections and paying MPs for their votes. People say Tshisekedi has to distance himself from Kabila but by force or what? Openly he cannot. Does Tshisekedi have any chance of wresting meaningful control or is he completely at the mercy of Kabila? He's at the mercy of Kabila. He's a nominated president. The president has to work closely with the Prime Minister, who is appointed by president but according to the make-up of parliament. That means Kabila's Common Front for Congo (FCC) coalition will get the Prime Minister. Whatever Tshisekedi does, the Prime Minister has to sign everything. The nature of the agreement I've heard about between Kabila and Tshisekedi says Tshisekedi will relinquish control in all economic areas, in mining, the finance ministry, the state miner Gecamines. Kabila is still there as well as in the army, police and interior. He is extremely rich and the people working for him have money too. How can Tshisedeki manage the country or address corruption when Kabila and his people are surrounding him? He's cornered. Also, article 165 and 166 of the constitution says that parliament can remove the president with a two-thirds majority. Kabila has it. Do you think Tshiskedi agreed to be president because he is ambitious and self-interested or naïve? I think he's ambitious and self-interested. He really wanted to be president. You don't think he has the country's best interests at heart and thought he could change things from within? No. When he went to US recently, he was asked about sanctions. He said it was a mistake to sanction the Independent National Electoral Commission (CENI). He didn't want to embarrass the people who elected him. The opposition Lamuka coalition relied on broad support, particularly from former Katanga governor and businessman Moise Katumbi and former vice-president Jean-Pierre Bemba. There are reports that Katumbi has pulled away from the coalition and is looking to ally with Tshisekedi. Is everyone in Lamuka on the same page as you? Lamuka isn't one guy's business. It's a spirit that embodies the Congolese people. If somebody wants to leave it, he'll be in trouble from the population. Even myself, I'm nothing. It's the population who anoints you, not yourself. I know Kabila is approaching some people, but they are not young boys. They know how to resist. Kabila considers Katumbi his enemy. I'm in close contact with him and Bemba. Bemba and the others will remain in the group. I think Katumbi will also be in the group, but if by any means someone goes, I don't think Lamuka will suffer. You're not concerned that, like Tshisekedi, people might not be offered something better by the government and leave? If you go out of Lamuka, you're finished. Kabila is finished. The Congo's international partners - the West as well as the Southern African Development Community (SADC) and African Union - seem to be looking away at what is happening. What do you say to them? They have to pay attention. This is the wrong strategy for Congo, for Africa, and for the whole world. Africa has about twenty elections in the next five years and dictators will think they can do what the Congo did and no one will take it seriously. Secondly, there's the moral argument. Thirdly, what lesson are they teaching the youth? SADC has strong presidents, who are working hard and want Africa to be developed. Some presidents are really happy Kabila has gone, but we have other presidents who are not happy. The British have done a good job. They still think on principle. The UK position is the way forward, to ask for the truth and the truth today is to reorganise elections so no one loses face. We will spend money but this is the opportunity cost. I think they have to continue and convince others. Like Brexit, if you are committed to something and you really agree, you have to continue. I have esteem for Madame Theresa May. She's a fighter. Like myself, I have to continue to be a fighter.